The Christmas Tree Barn opens in December 2019. For many of our customers, coming to Slamseys to choose their Christmas tree is the start of their festive celebrations. So, pull on your Christmas jumper and come to Slamseys to choose a fresh Christmas tree that will fill your home with colour and a wonderful smell. The Christmas Tree Barn is open every day until Sunday 23rd December. Our friendly and knowledgeable staff are here to help you choose your tree and wrap it for you to take home but read these Six Tips to Choosing a Wonderful Christmas Tree before you set out to buy your Christmas tree. Slamseys Farm is in Essex, next to the A131 between Braintree and Chelmsford and only forty miles from London. We have free parking and wheelchair access to the Christmas Tree Barn where hundreds of premium quality, fresh Christmas trees are displayed. 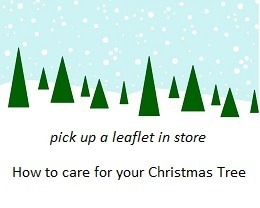 Please pick up a Caring for Your Christmas Tree leaflet from the Christmas Tree Barn and follow the instructions. Your Christmas tree is a living thing with a limited display life, so take it into the house as close as possible to 25th December if you want it to look fresh and glossy on Christmas Day. If you put up your tree in a warm house at the beginning of December, you must expect some deterioration by Christmas Day. Norway Spruce trees should not be brought inside until the week before Christmas. 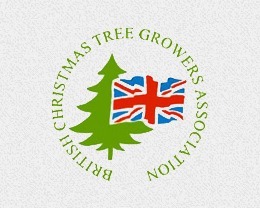 Our philosophy is simple: we want to help you choose the Christmas tree for your home or workplace. Buy sawn trees in heights from 1 metre to 5 metres and small trees grown in containers. Our Christmas trees are grown here at Slamseys Farm and we buy some from selected growers so that we can offer a wide range of sizes and shapes. In recent years, the Nordman Fir has become our customers’ favourite Christmas tree. The Nordman Fir has dark green glossy foliage with soft needles that make it ideal in homes with young children or pets. The Nordman Fir also has good needle retention, which means there aren't too many needles to sweep up. However, you must still water your tree and not place it in a hot room. Our most popular Nordman Fir trees (5 - 7 feet high) cost £42 - £49. The Norway Spruce is the traditional Christmas tree with a wonderful smell and triangular shape. Norway Spruce trees are best kept where they won't be constantly knocked and care must be taken not to let them dry out. The Norway Spruce is our most popular tree for placing outdoors. 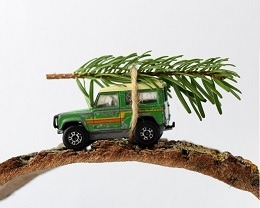 We hope you'll be very pleased with your tree, but every now and then there may be a problem. If you’ve followed the care instructions but aren’t happy with the condition of your Christmas tree because there is excessive needle drop or branch droop, please return your tree to The Christmas Tree Barn or email us at info@slamseys.co.uk and we will replace the faulty tree. After fourteen days from the date of purchase, replacement is at our discretion.